Snack Girl is a bit obsessed with smoothies right now. Something about the weather heating up, makes me want to drink frothy drinks. My usual frothy drink does not include carrots or kale, but I am doing my best to try new things. My last smoothie recipe included a contest. You still have time to enter to win $25 worth of Medjool dates – see You Have A Date With This Smoothie. I do not have a Vitamix so it is a bit tricky to blend a vegetable as crunchy as a carrot. My blender retails for about $50 and it gets the job done most of the time. Once, I bought one of those $15 blenders at Walgreen’s and it was a failure. The key here is to blend up the carrots before you add any of the other ingredients so they are pureed and can be slurped up a straw. I like this smoothie poured over ice because it is quite thick and this also allows me to save the other serving for the next day. My husband did not like this – he said it tasted too healthy ☺. 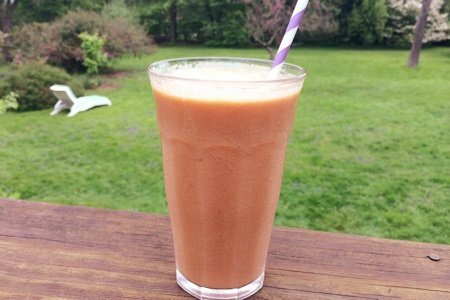 You have to like the carrot/ginger flavor combo to enjoy this smoothie. You can skip the honey if you want it to have less sugar but then it will be less like cake. This smoothie is healthy – 110% of your daily value of vitamin A, 5% of your daily value of iron, and 36% of your daily value of calcium. Do you blend carrots? What do you make with them? I use carrots all the time, I just buy bags that are shredded already. I mean they're .99 usually! I use kale in our smoothies. One cup has 133% of %Daily value of A and 134% of vitamin C. It has 684% of vitamin K and 10% DV of heart healthy vit. B6, 299% Dv of potassium. Kale has more protection for the eyes than carrots to protect against macular degeneration that leads to blindness. So with more vit. C, B6, iron and potassium and low in oxalic acid, I think kale is the biggest powerhouse. I love carrots, but kale is easier to use and has more benefits per cup. "kale contains 45 — count 'em, 45 — different flavonoids with a variety of antioxidant and anti-inflammatory effects." Just made this smoothie and I LOVE it!! Tastes exactly like carrot cake. I usually juice carrots, but they blended up very nicely into a puree in my blender. I also use the grating attachment on my food processor to make carrot and apple salad. Just shredded carrots, shredded apples, and a little lemon juice. Very yummy! I put kale in every smoothie. If you use fruit, you can't taste the kale at all. Buy a Vitamix! or a Bullet. They are worth every penny!! You won't need a food processor or a blender if you buy a Vitamix and Costco has a terrific price either online or in the stores. Frozen fruit takes the place of ice too! Oh, I one more thing - slice and freeze old bananas and add them to smoothies - makes it cold and thick like a milkshake! I use about a half banana, vanilla yogurt, frozen berries, some milk, banana, kale and sometimes a scoop of protein powder. A Vitamix will process all this in less than a minute! Carrot cake, what's not to love. I usually add a date to my smoothies to make it sweet and the extra nutrition and fiber. My go-to smoothie is one I found a few years ago on this very website! 1/2 - 1 whole banana, frozen, sliced mixed with cold coffee and 1-2 TBS unsweetened cocoa powder. I altered the recipe to include 1/3-1/2 c. fat free Greek yogurt. Yum! I really enjoyed this! Wasn't sure how my blender would handle the chopped carrots, so I grated them first. Also used a frozen banana so it was nice and thick and some vanilla just because I like it... Thank you Snack Girl for the recipe! I just bought myself a VitaMix so I am totally digging any sort of smoothie recipes so I will be trying this one soon! Thanks for sharing! Yummy. i just found some carrots yesterday in my fridge, I think I have all that I need for this. I'm so stoked! Have you ever tried the NutriBullet? Not too expensive, I think I paid $99 for mine. I have used it once, twice, sometimes three times a day for about a year and a half now. It still works great. It's not best for straight veggie juices, though. I usually make a fruit smoothie and add some kale or spinach to it. I recently bought Snack Girl to the Rescue and cannot say enough good things about it. I have made soooooo many of the recipe's in it. Buy LISA you promised to send me goodies if i PRE-ORDERED the book on Amazon and i never got any?? @Sharon & @Judi - I will e-mail you both offline and get this fixed. I am so sorry! Tried this today and we loved it. Perfect flavors. I was able to puree the carrot with my immersion blender, but I did slice up pieces pretty thin. I thought about the shredded carrots Judi suggested - next time! Thanks for a great recipe. Delicious smoothie. Thanks Snack Girl!